Ripped Recipes - Banana Oat Pie. 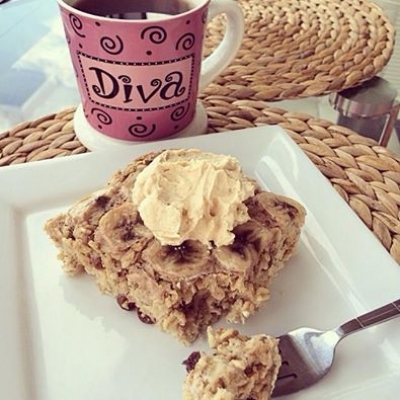 Home » Recipes » Breakfast » Banana Oat Pie. Recipe: In a bowl mix 2 cups of old-fashioned oats,1 tsp baking powder, cinnamon. In another bowl mash 1,5 banana, add 2 egg whites, 1,5 cups of almond milk, stevia. Whisk together. Pour over dry ingredients. Mix. I also added some raisins and walnuts. Cut 1 banana into circles and place on too. Bake at 375 for 30 min. Enjoy warm or cold.